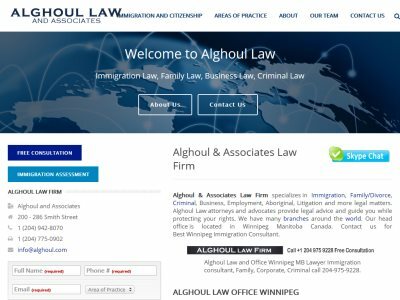 Alghoul & Associates Law Firm is a law firm in Winnipeg, Manitoba. With international branch offices in: UAE, Egypt, Lebanon, Jordan, Azerbaijan, Uganda, Kuwait, Pakistan, Turkey. The law firm specializes in Immigration, Family/Divorce, Criminal, Business, Employment, Aboriginal, Litigation. Practice Areas: Aboriginal, Alternative Dispute Resolution, Arbitration, Bankruptcy/Insolvency and Corporate Recovery, Charities and Not-For-Profits, Day School, Insurance, Labour and Employment, Litigation, Mergers and Acquisitions, Municipal, Pension, Commercial Real Estate, Construction, Corporate and Commercial, Criminal Law and Regulatory Offences, Environmental, Family, Financial Services, Immigration, Residential Real Estate, Securities, Taxation, Technology and Privacy and Intellectual Property, Transportation, Wills and Trusts and Estates.